If you have a Canon EOS DSLR and a Android tablet (phone), all you need is the correct USB-Cable and you’re ready to go! Ready for the DSLR Controller Beta app and ready to control your beloved Canon DSLR from your relatively big tablet screen! No Computer or laptop needed, also NO root required! This app is perfect for amateur and pro photographers looking to preview their pictures on a larger screen before taking a shot. 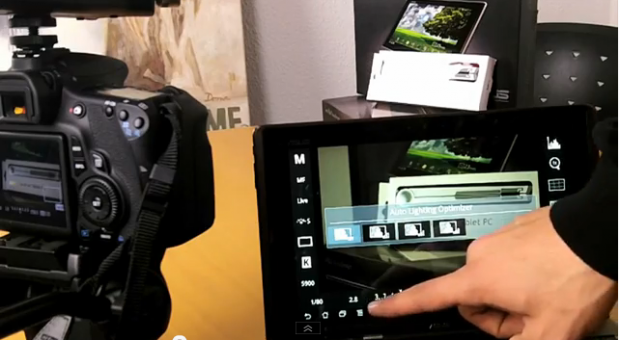 So if you thought about getting an external monitor meet the DSLR Controller app. The DSLR Controller Beta app enables you to change settings of your Canon EOS DSLR comfortable. Check our full video review on the DSLR Controller App, we did with the Asus Eee Pad Transformer and a Canon EOS 60D after the break. …NOTICE: This is a BETA / PRE-RELEASE version. The product is not finished yet and there will still be issues. Due to massive demand and a great many requests to release, it is being released early. The price will go up once v1.0 is reached, but the upgrade is free for those who have this BETA. Available options depend on the mode you have your camera set to (M, Av, Tv, etc) and the camera model. Refer to the website ( http://dslrcontroller.com/ ) for further details. Does this work on a Canon 5D mArk III?